At the beginning of the last century, rail transit was already in operation in New York City. The horse drawn rail car was a means of public transit. 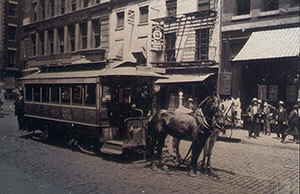 The efficiency of steel wheel on steel rail was demonstrated by the two horses being able to pull a heavy rail trolley car on Broadway and Beeker Street. Since that time progress in transportation has been remarkable with the personal automobile now considered a necessity, but the steel wheel on steel rail is still the most efficient means of moving people and goods today. Many companies have come and gone over the past 100 years but those that provide superior products (and services) and tailor them to the needs of the marketplace still prosper today. Experienced and highly qualified teams of individuals were responsible for the success of these leading companies. As you have likely noted, it is quite difficult to find experienced and qualified technical personnel today. As a leader in his industry, Professional Engineer and Consultant Richard Curtis has been responsible for significant contributions in the rail industry over the past 30 years. Mr. Curtis’ design projects include the NJ Transit Comet I, Amtrak Superliner, MBTA #1 Red Line, NYCTA R-46, Auto Train, RoadRailer Mark V and Amtrak MHC cars. In addition, he has headed the design team on transit and commuter car trucks for BART, METRA, MARTA, NCTD, West Coast Express, Tri-Rail and LA Metro-Link. As a technical consultant to MBTA, NYCT, WMATA, Pheonix Valley Metro, UTA, NICTD, CALTRANS, AMTRAK, Detroit People Mover and Seattle Monorail, Mr. Curtis has provided technical expertise in an oversight role to insure that the design, manufacture, overhaul and testing met all necessary requirements. Several transit authorities and railroads have called upon him to solve difficult maintenance and operational problems. He has directed design related to mid life overhaul and modernization on major contracts. He has played the lead role on proposal teams assisting clients in gaining multi-million dollar contracts. His market studies for several clients have triggered millions of dollars of new business. He has also been responsible for design, development, procurement, marketing, leasing, operation and maintenance of all types of freight cars. This included industry leading innovative design and development on Double Stack Container Cars, Auto Rack Technology, Unit Train Coal Cars, Coil Steel Cars, Covered Hopper Cars and Heavy Duty Special Purpose Cars. In fact, some of this modern freight car technology is now being exported to Europe. During his career Richard Curtis has been responsible for international technology transfer in the areas of passenger car, freight car, passenger car truck, auto rack and RoadRailer design. As a result, he has been able to compare and evaluate rail technology around the world during travel to Germany, France, Spain, England, Holland, Australia and New Zealand. For 20 years, through his highly successful consulting practice, Mr. Curtis has provided Engineering Management, Vehicle Engineering, Marketing, Sales, Project Management, Testing Support, Systems Engineering, Inspection Services, Specification Preparation, Engineering Evaluation and Litigation Support within the industry. His clients have included transit authorities, railroads, engineering consulting firms, investors, car builders and suppliers.